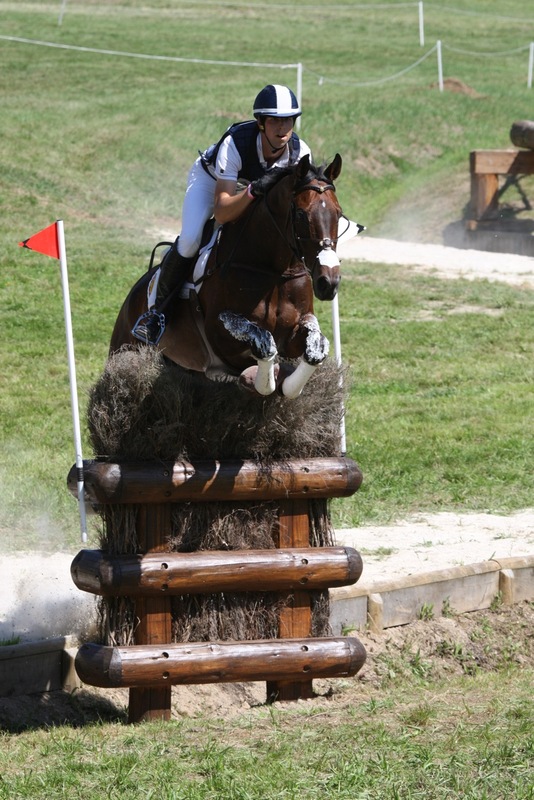 Clarke Johnstone (NZL) on Orient Express seals victory in FEI World Cup™ Eventing 2011. Photo: PSV J. Morel. Clarke Johnstone (NZL) was celebrating with a large bottle of champagne, part of his spoils from Haras du Pin (FRA), where he finally sealed victory in the FEI World Cup™ Eventing 2011. Johnstone is perennially successful in FEI World Cup™ Eventing - he finished fifth overall last year - but this time the 24-year-old World team bronze medallist set an unmatchable target right from the start of the season. He scored a win and a third place in his native New Zealand, at Kihikihi, and when he also triumphed in the next event in the series, at Sydney (AUS), the dye was cast. For good measure, Johnstone completed Haras du Pin (FRA), the seventh and final event in the 2011 series, in sixth place on Kihikihi winner Orient Express, but his overall series victory was assured even before the competition started at the French venue. Another of the younger riders, Christopher Burton (AUS), tracked Johnstone all the way, only finishing four points shy to take second place in the series. Burton put up a magnificent fight. Having slotted into second at Kihkihi (NZL) and second and fifth at Sydney (AUS); riding the same two horses, Newsprint and Holstein Park Leilani, he then finished second and third at Haras du Pin to close the gap. But even if he had won the series climax, he would still have been an agonising one point in arrears behind Johnstone. At the culmination of seven fiercely contested CIC3*s in seven countries, Belarusian rider Aliaksandr Faminou has made history as the highest placed rider from Eastern Europe in the history of the FEI World Cup™ Eventing. His brilliant achievement of three placings at Minsk (BLR) proved highly profitable, leaving him third in this year’s series. Southern hemisphere riders filled seven out of the top 10 places at Haras du Pin (FRA), site of a French national stud and one of the most attractive venues in the calendar. In a tight finish, Clayton Fredericks (AUS), twice an FEI World Cup™ Eventing champion, riding Dunges Laurent Rose, won by less than one penalty ahead of Burton on Newsprint. Fredericks had led after Cross Country on his other horse, the German-bred mare Be My Guest, but an expensive 16 Jumping faults dropped the partnership to fourth behind Burton’s Holstein Park Leilani. After a relatively trouble-free Cross Country phase, the Jumping proved hugely influential - there was only one clear round from the 34 riders to complete the competition. “The efforts of New Zealand and Australia to gain points in Europe this year have really paid off, with Clarke Johnstone, Christopher Burton, Shane Rose and Clayton Fredericks all in the top six,” said Catrin Norinder, Director of Eventing & Olympic at the FEI. “The fact that eight nations made it into the top ten of this year’s FEI World Cup Eventing is also testament to how widely this trophy is contested globally. Clarke Johnstone (NZL), 24, is from New Zealand’s South Island where his parents farm sheep and cattle. He started riding at the age of 12 and after graduating from Otago University, he spent three years based near Hamilton, North Island. He has now travelled to Gloucestershire, England, with five horses and the aim of competing at next year’s London Olympic Games. He was long-listed for the 2008 Olympics with Oakley Vision, a horse he started riding when he was only 14, and made his team debut last year with Orient Express, a horse produced by 2000 Olympian Paul O’Brien (NZL), winning a team bronze medal at the Alltech FEI World Equestrian Games™ 2010 in Kentucky (USA). He now heads to Burghley CCI4* (GBR) with Incognito and Taupo CCI3* winner Kolora Stud Secrets and to Blenheim CCI3* (GBR) with Orient Express. For full standings, please click here. *The total prize money for FEI World Cup™ Eventing 2011 is €28,000. This year there were seven legs in the series, with each leg contributing €4,000.